Institute striker Alex Pomeroy came off the bench to score against Knockbreda. Young striker Alex Pomeroy had an eventful day, as Institute secured their first league win in five games, seeing off a hard working Knockbreda side. Pomeroy, who wasn’t in the original Stute match day squad, but after Stephen Curry pulled up in the warm-up, he was drafted onto the bench and made a big contribution towards the outcome of the game. Institute went close to taking an early lead but Raymond Foy’s 25 yard curling effort was kept out by a fully stretched Knockbreda keeper Ryan McBride. Just before the half-hour mark Robert Burns was inches away from giving the visitors the lead, but his left footed volley was superbly tipped onto the bar by keeper Marty Gallagher. The deadlock was broken two minutes later from the penalty spot as Jamie McIntyre, was brought down inside the box by Andrew Ferguson and referee Garvin Taggart rightfully pointed to the spot and Michael McCrudden made no mistake with the resutling effort from 12 yards. On 42 minutes the home side went close to adding a second, but Gareth Brown’s shot from a tight angle, which had McBride beaten, rattled the bar. The visitors brought on Abiola Sanusi at the break and the big striker made a massive difference to the Belfast men. Sanusi was a handful and he created a super chance on 61 minutes when his cut-back found Mark Cooling on the edge of the box, but the midfielder dragged his shot wide. Knockbreda deservedly levelled things on 71 minutes as Cooling’s free-kick from the right, found Burns and his powerful header from 10 yards flew past Gallagher. Boss Kevin Deery brought on substitute Pomeroy for Gareth Brown just after the hour mark and the young striker scored the all important second goal on 85 minutes. He played a neat one-two with McCrudden on the halfway line, calmly raced clear of the Knockbreda defence, before showing great skill to dink the ball over McBride from an acute angle. 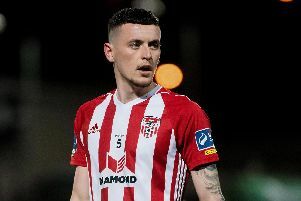 The points were sealed on 89 minutes as Morrow scored his first goal for the Waterside men, planting the ball home from the penalty spot, after Niall Grace had been brought down inside the box. Institute: Gallagher, Devlin (McDermott 67), O’Donnell, Scoltock (Roddy 79), R Morrow; Brown (Pomeroy 67), Foy, McCrudden; Grace, S Morrow, McIntyre. Knockbreada: McBride, King, Cockcroft, Ferguson, McBurney, Devine, Perry (Sanusi HT), Cooling, McNeil, Burns, Parker.